BlackBerry is no longer focusing on beating the iPhone and Android, but that doesn't mean it's giving up on smartphones entirely. The ailing firm unveiled its new Q20 smartphone on Tuesday, a device that tries to marry two separate mobile technology worlds. It comes with a physical keyboard, an old-school trackpad, and menu, send, back and end buttons. But it also has an iPhone 4-like 3.5-inch touchscreen. The Q20 will likely appeal to longtime BlackBerry users who have resisted transitioning to touchscreen-only phones. But drawing new customers is another matter. "The Q20 is a good way to shore up the base, which is important, but what it doesn't do is provide a compelling reason for new people to switch from Android or iPhone to BlackBerry," said David Braun, CEO of strategic consulting firm Capstone. 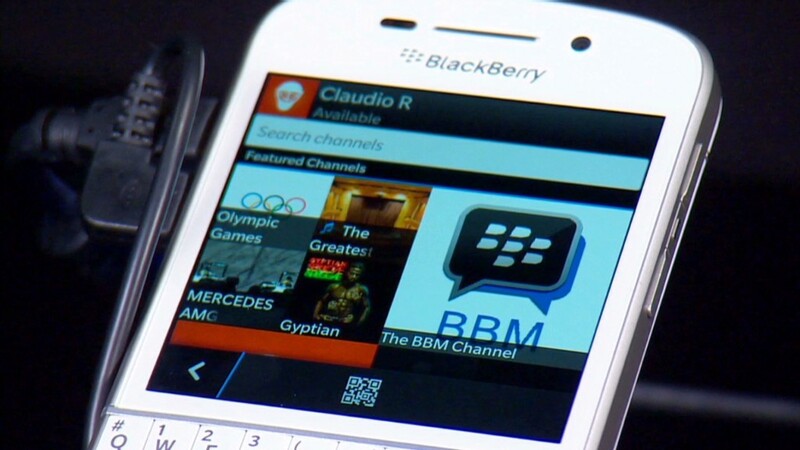 The Q20 will be available "in the second half of 2014," BlackBerry said. Pricing details have yet to be announced. The news comes as BlackBerry attempts to reverse its years-long decline with a new collection of devices, a renewed focus on business customers and a push in software and services that can run on phones made by its competitors. The task won't be easy. BlackBerry's recent financial results have been awful, with the company posting a whopping $4.4 billion loss for the quarter that ended in November. Leading the transition effort is new CEO John Chen, who turned around the once-struggling software maker Sybase and sold it to SAP (SAP) in 2010. "We have engineered a new strategy to stabilize the company and restore our customers' confidence in BlackBerry," Chen said in a statement Tuesday. BlackBerry (BBRY) shares rallied following the announcement Tuesday, gaining nearly 9%. It is by far the best performer in CNNMoney's Tech30 index, with shares soaring by nearly 43% this year. But investors were more excited by comments from Chen at the Mobile World Congress in Barcelona, where he told Bloomberg he'd be open to selling or spinning off the BlackBerry Messenger service after developing it further. BBM is in focus following Facebook's blockbuster acquisition of messaging service WhatsApp last week for $19 billion. BBM boasts around 85 million monthly active users, compared with more than 450 million for WhatsApp. BlackBerry unveiled a new version of its messaging service Tuesday called BBM Protected, with a focus on increased security for business clients. "Nobody has a secure messaging infrastructure, and we're the only ones who have it," Chen told Bloomberg. "It's important that we showcase and use that as a differentiator into the thousands and thousands of enterprise customers." BlackBerry announced a handful of other new software products Tuesday, as well as a low-end, all-touch smartphone called the Z3 that's aimed at the Indonesian market. BlackBerry will compete there with China-based Lenovo, which acquired Google's (GOOG) Motorola Mobility smartphone unit last month for $2.9 billion. The Z3 and Q20 are the first products to emerge from BlackBerry's new partnership with electronics maker Foxconn. Under that five-year agreement, Foxconn will develop and manufacture certain BlackBerry devices and manage that inventory itself, while BlackBerry focuses on software and high-end phones.